Two barges collided with the tanker Saturday, the Coast Guard said. (CNN) -- Crews removed about 46,000 gallons of oil from waters near Port Arthur, Texas, on Sunday, roughly 10 percent of the oil spilled a day earlier when a tanker collided with two barges, a U.S. Coast Guard officer said. An estimated 462,000 gallons of crude oil leaked from barrels aboard the tanker, forcing the closure of the port in southern Texas, Petty Officer Larry Chambers told CNN. The Sabine Neches Waterway near Port Arthur also was closed. It was unclear Sunday when the port, about 100 miles east of Houston, Texas, will reopen or when crews will finish the cleanup, he said. "We certainly want it to be done as soon as possible, but with that said, safety is the main issue," Chambers said. "We're not going to open the port until it's determined that vessels can pass through cleanly, safely and not cause any further damage." 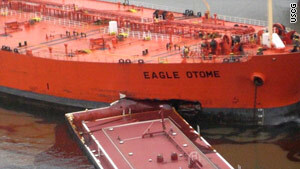 No injuries were reported when the Exxon Mobile-chartered tanker -- the 807-foot Eagle Otome -- collided Saturday with two barges being towed by a tug boat. The tanker was carrying about 570,000 gallons of crude oil to Exxon's Beaumont refinery when it crashed, Exxon Mobile spokesman Kevin Allexon told CNN. The cause of the crash was unknown, but is under investigation, he said. "We are very concerned about how this could have happened," Allexon said. "We are very concerned about the impact to the environment, to the community. No one wants to see this happen." The port is primarily for industrial use, but it is not far from wetlands. None of the nearby marshes or sensitive wildlife were adversely affected, Chambers said, but one heron was "oiled." The bird was alive and undergoing treatment, he said. An evacuation order that was imposed in a 50-block area around the port after the collision was lifted. That area was evacuated Saturday out of caution, as the tanker was carrying a type of oil containing sulfide. Fifteen skimming vessels sailed the area recovering the oil and workers dropped more than 45,000 feet of boom -- fencing-like material -- to keep the oil from spreading, Chambers said. More than 500 people were involved in containing and cleaning the spill, said Darrell Wilson, spokesman for Malaysia-based AET Tanker Holdings, the owner of the tanker. The biggest oil spill in U.S. history occurred in 1989 when the Exxon Valdez ran aground on a reef in the Gulf of Alaska, resulting in the spill of 11 million gallons of crude. CNN's Khadijah Rentas contributed to this report.